Your France Vacation Made Easy and Perfect! A stroll along a quaint cobblestone street in France? 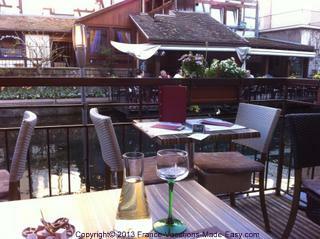 Dinner in a bistro with a lovely glass of local wine? Shopping in chic, pint-sized boutiques for that one of a kind treasure to bring back home? Except for all the kinks. Like, where to stay, and how to book that special room and be sure that the bathroom isn't down the hall. How to get from the out-of-town airport to that special hotel? Rent a car! Read the map, or better yet, get a GPS! Oops! The GPS lady speaks French! Navigate on your own trying to guess at what the signs mean, trying to guess who goes when at an intersection where there is no stop light! And what's with all the traffic circles? Stop the car, abandon it, in fact, and find somewhere to eat. How to order a really good inexpensive wine, yet be sure you won't regret it all night long once you're back in that special room? Sure there's a concierge at your hotel, maybe. And sure, quite possibly, he speaks a little English, except where his version of English is spoken is somewhere you'll never want to visit. The wait staff in that trendy little bistro? They can see that you're American, can hear it even, and will offer you the most expensive options, not the best mind you, just the most expensive. You could be walking around wearing dollar signs on your forehead and it would have just about the same effect. But you're reasonably intelligent, so, before going, you buy an audio program and brush up on your long-forgotten high school French during your commute to work. Good for you! You've learned how to ask directions to the bathroom! The only problem with that is when somebody answers you with a verbal delivery approaching the speed of light. Then what do you do? If you're lucky, someone will take you by the hand and lead you to a “bathroom”. Relief! Until you look around and see a bathtub, sink, mirror and what? No.... ermm....toilet? Confusion! Frustration! Imminent danger of serious embarrassment! It doesn't have to be that way. An average American can have a wonderful French vacation without the anecdotes which are so amusing once you get back home, even if they weren't at the time. Read on, take heart, and start to pack your bags. This site will help you take control of your hard earned vacation dollars and make sure that your France vacation is filled with the kinds of memory making moments that YOU want. The good ones. All you have to do is find a flight and you can do that from home. All the pages on this site have a 'share this page' invitation to buzz the popular social bookmarking sites of Google, Yahoo Buzz, Facebook, Stumbleupon, My Space, Technorati and del.icio.us etc (scroll to the bottom of any page and you will find the link buttons). 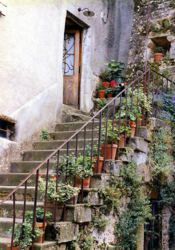 If you agree that my site is a unique and valuable resource for planning a vacation to France -- then click it forward!! -- pass it on to your favorite network. Together, we can Share France with the World!